Look, up in the sky! It’s a bird! It’s a plane! No, it’s… it’s… Janet Yellen in a helicopter with bags of cash. No kidding. That’s the Fed’s plan when the next recession hits. The Fed’s Dear Leader coming to the rescue with airdrops of free cash for everyone. What could possibly go wrong? 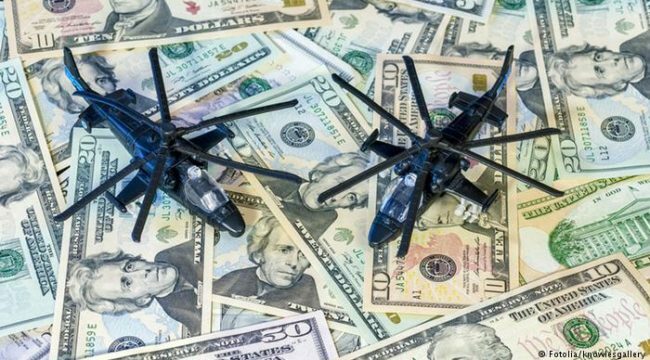 At a recent press conference, Federal Reserve Chairwoman Yellen admitted that the Fed would consider using “helicopter money” in an extreme downturn. What’s “helicopter money”? It’s a phrase used to describe when governments print massive sums of money and then “drop” them on the economy… hoping for the best. Sound insane? It is. But doesn’t economic growth come from savings and investment? Silence. Today, you can supposedly create real economic growth right out of thin air. Just print the money and start giving it away for free. It’s fake money of course, but we pretend it’s real. See how easy it is to hoodwink the masses? To comfort the proletariat, Yellen said that “helicopter money” would only happen in “abnormal” circumstances. Kind of like the “abnormal” zero interest rates (soon to be negative) that we’ve had for an “abnormally” six-plus years. Abnormal is clearly the norm now. In other words, count on it. Helicopter money is coming the moment the S&P 500 takes a serious downturn. Ever since the dotcom bubble, the Fed and other central banks have tried to force banks to lend more to spur economic growth coming out of financial crises. What if the growth is fake or unsustainable? No matter. Pay for it another decade. They started with zero interest rate policy (ZIRP). But that money hasn’t gone out into the real economy. It’s remained with the banks. And what a great deal for them! They borrow for zero then use the cash to make billions scalping every day using high-frequency trading. When ZIRP didn’t force people to invest in Timbuktu condos, central banks in Europe and Japan moved to negative interest rate policy (NIRP). The thinking goes that NIRP would surely force people to borrow, spend and buy those Timbuktu condos instead of paying interest on their savings. Think about how crazy all this is. Force average citizens to choose between paying interest on their savings or investing in casino investments engineered by the central banks to collapse at any moment. But none of this is working — whatever the hell “working” means to people like Yellen. Savings rates in NIRP countries are actually going up. And in Japan, fearful citizens have started hoarding cash. The Japanese are buying safes in record numbers? You bet. So what do you think people will do when Yellen makes like Santa Claus and starts handing out free money? Do you think that will instill confidence in consumers to spend more as opposed to saving for what they instinctively know is a coming meltdown? Do you think the Fed’s actions will encourage companies to make additional capital investments in their businesses instead of hunkering down for the collapse they also know is coming? Since the financial crisis in 2009, central banks have printed $12.3 trillion of money and made 654 interest rate cuts to support the global economy. Well, it’s obviously been great for Wall Street billionaires and stock indexes. But the rest of the experiment has been a huge bust. It’s devastated those who rely on interest income for survival. Plus, we now have $200 trillion in worldwide debt, asset bubbles galore and stagnant global economic growth. Usually, when the sink is overflowing, smart people turn off the faucet. But the Fed is looking to increase the water flow. And if the Fed doesn’t come up with a new scheme to artificially goose the economy after NIRP failure, what’s the alternative? A massive deleveraging of credit, a stock market collapse and a prolonged recession. A clearing out of the excesses of the business cycle used to be normal. But do you think Yellen & Co. are going to let “normal” happen on their watch? As soon as the U.S. economy slips into recession, it’s only a matter of time before the debasement of paper money will continue unabated. And more people will be looking for the safety of gold as they have in recent months. Gold surged to a three-year high last week. I don’t prefer chaos. But if it’s going to happen, you should be ready… long before you hear the sound of helicopters in the sky.